(AP) DENVER - Peyton Manning met for nearly six hours with the Denver Broncos on Friday, then left the team's facility without speaking with reporters. About 48 hours after being released by the Indianapolis Colts, Manning met with another Super Bowl-winning quarterback, Broncos vice president of football operations John Elway, and coach John Fox. The three chatted while taking a tour of the team's practice field and heading to the weight room. They spent several hours together after that before the four-time MVP departed. It was the first stop on his free-agency tour of NFL suitors. Video: What's Peyton Manning's next stop? The plane then stopped in Stillwater, Okla., where Elway, Fox and Broncos general manager Brian Xanders were watching Oklahoma State's pro day. 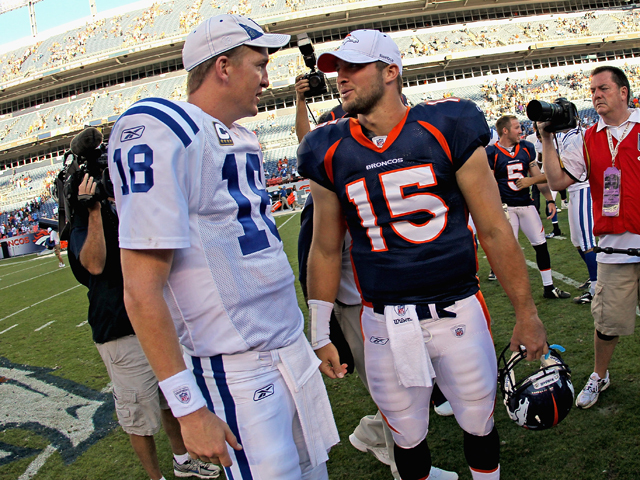 That contingent joined Manning, and everyone flew back to Denver, the Post reported. ESPNews carried live coverage of the flight arriving at an airport in Denver, then also followed Manning's car ride to Broncos team headquarters, an indication of the frenzy being stirred up by Manning's courtship. And this was only Day 1. The Broncos are merely one of perhaps a half-dozen  or more  clubs that are thought to be seriously interested in signing Manning, even though he turns 36 later this month and is coming off a series of neck operations. He missed all of last season, and the Colts decided to cut ties rather than pay a $28 million bonus that was due this week. Arizona, Miami, Kansas City, Seattle, Tennessee, Washington and the New York Jets all are considered possible destinations; Manning's former offensive coordinator in Indianapolis, Tom Moore, worked for the Jets as a consultant last season. It's not very often that teams get a chance to sign a QB who's thrown for more than 50,000 yards and nearly 400 touchdowns, been picked for 11 Pro Bowls, and been a Super Bowl MVP. Manning's importance to the Colts' success was never more apparent than last season, when their record plummeted to 2-14 without him. Because he was released and went on the waiver wire Wednesday, Manning is allowed to negotiate and sign with any club immediately; he does not need to wait until the free-agent period that begins next Tuesday. Chiefs owner Clark Hunt confirmed in an interview with NBC Sports Network that was scheduled to air Friday evening that his team is pursuing Manning. "I don't know how important money will be to him, but I'm sure it will be part of the equation," Hunt said. "He's going to be looking for an environment that he's comfortable in." He declined to say whether the Chiefs already have offered Manning a contract. "I don't think it would be appropriate for me to talk about discussions at this point," Hunt said, "but he is somebody that we'll want to talk to."